Disclaimer: This post contains affiliate likes. If you purchase something through these links I may receive a small percentage of the sale. The kind people of Furls provided me with the hooks for this review. I was not required to write a positive review. These opinions are 100% mine. Edit (as of Jan. 6, 2016): In this review I mention I don’t like that the hooks aren’t labeled. Furls let me know that they have plans to release all Odyssey hooks with their letter and mm sizes printed on them in about 2 months (as well as introduce sizes B, C, and D) and anyone with an unsized hook will be able to trade it in for a sized hook! Great news! 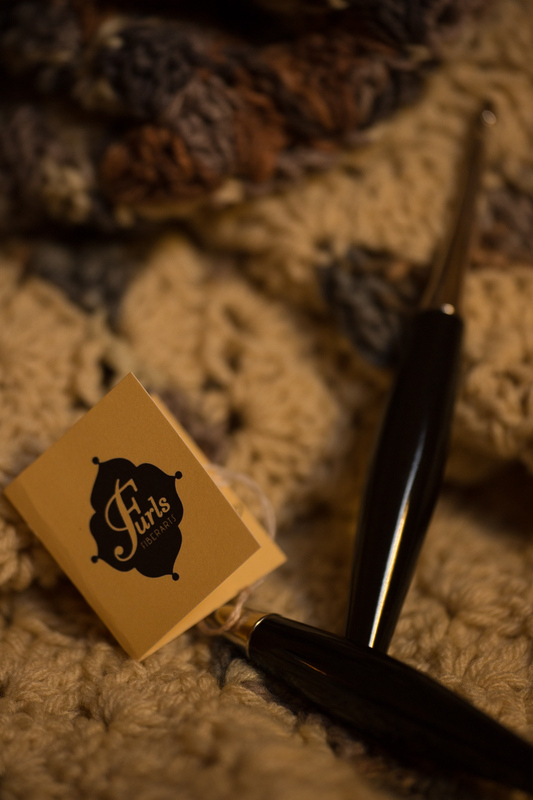 I’ve been eyeing Furl’s hooks for quite some time now but at almost $80 a hook they were just out of my price range. That’s why when I saw their new Furls Odyssey hooks this Summer I got really excited. They are just as beautiful and luxurious as their hand crafted wood hooks but at $29.99 they are much more affordable. I also love that they are still hand made in the US with quality materials. When I got my hooks in the mail and opened them up my first thought was, “Wow, how simply beautiful!” Then I thought, “Wow, they’re big!” I picked them up and I’m not going to lie, I thought they were really heavy (don’t worry, it gets better!). The hooks are about 6″ long and a little over .5″ wide at it’s widest in the grip. The grip is made of a black resin and the neck is nickel-plated pewter. I was a little disappointed the hooks themselves are not labeled. I got a G and an H hook I could see my self easily mixing them up. The hooks came in nice boxes that are marked with the size. They’re pretty and all but a little clunky for storage in my opinion. I think I might take two different colored beads or something and glue them onto the bottom of the hook so I can store them out of the boxes and not worry about mixing them up. Like I said, I was worried they were too heavy and large. I’ll be honest, it felt a bit clunky at first but once I got past the first or second row of my first swatch it was heaven! Don’t think these are just good old aluminum hooks with a nice resin handle slapped on. First, the nickel-plated pewter neck glides through yarn like butter. I tried cotton, acrylic, wool and a linen blend. All slid absolutely beautifully over the neck. Second the resin handle is strong! They say it will take almost half a metric ton of force to break it. I love cluster stitches and I don’t know about you but I can almost never get through a cluster without the hook catching in the yarn as I pull that last yarn over through. Guess what? With the Odyssey I had no problems with this. I couldn’t believe it, the hook came right through all the yarn overs and no struggling to get it out! That alone was exciting enough for me to get over the no size labels. I can see why they claim on their website that the hooks will help you crochet faster. The more I worked, the more I felt the weight wasn’t an issue at all. I have fairly small hands and I was worried the whole hook would overwhelm my hand but it actually fit very nicely in my hand. After working one swatch I had no pain in my hands. I could see myself crocheting with these for a long time without any issues. Upon first impressions I wasn’t too sure about these hooks but they really grew on me and lived up to the hype on the Furls website. I was a little disappointed they are not labeled with the size but I can see these hooks allowing me to crochet longer and faster. Overall, think they are a wonderful product and worth every penny. To purchase your Furls Odyssey hook click HERE. 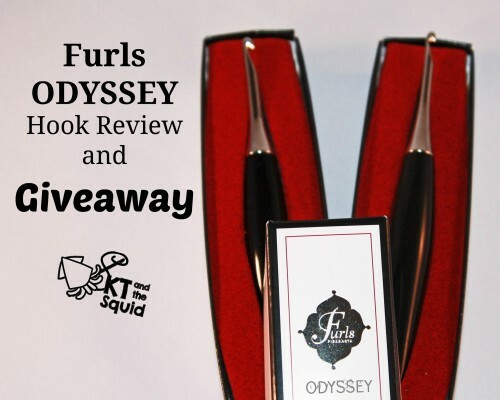 Furls is letting me give away TWO hooks to ONE lucky winner! One winner will receive 2 Odyssey hooks sized to their preference. This giveaway is open worldwide to all people 18 years or older (void where prohibited). All you need to do is enter your email below. Please enter an email you check regularly. These emails will not be sold and will only be used to contact the winner. Giveaway ends Dec. 22, 2015 at 12 am PST. Good Luck!